With an aim of promoting numerous culture and eradicating geographical boundaries "Lokrang 2019" took off on Saturday with the same festive fervor at Bharat Heavy Electricals Limited (BHEL) Dusherra ground. The festival will last till January 30, 2019. The basic objective behind this event is to promote the tribal and local artwork of the state to the art lovers of Bhopal. This festive season, Newscrust takes a glance and gives you a glimpse of what the festival of art and culture is offering to Bhopalites. Lokrang this time has incorporated a total of 179 stalls consisting of different decorative items, different types of attires, handicrafts and much more. Every stall offers something different and interesting to its customers. The inaugural ceremony of this event started with a totally new concept “Gond Ramayani" which was directed by Suman Saha and was narrated by a prominent actor Rajive Verma. Introducing the audience to a unique Ramayana, Gond Ramayani, and was directed by ace theatre personnel Suman Saha. Though the dance drama was very visually impressive, it failed to convey the message to the audience, leaving them confused. Gond Ramayani is a mixture of all the epic eras of Indian mythology. Therefore it includes characters from the Mahabharata and Ramayana. The lead character of this Ramayana is Laxman around whom the story revolves. The Gond tribe is believed not to have a time cycle therefore all the eras of Indian mythology were merged, sources said. Some stalls this time are up with the different and unique form of artworks which are attracting a lot of people. 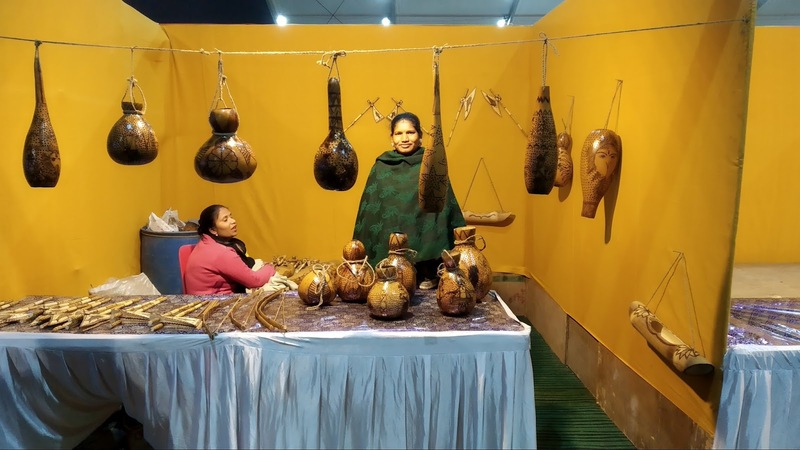 While talking to one of those stall owners which named as "TUMBA CHITRA" - we came to know about a different type of artwork which is made up of "lauki" (bottle gourd). Decorative items in their stalls were made by burning that bottle gourd and then carving them, which ultimately results in beautiful showpieces. This form of artwork is quite famous among the people of Bastar (A district in Chattisgarh). While talking to Adhikar of Sridhar stall of "Patta Chitra”, he said "The decorative items and all the pictures in his stall were made up of palm leaves" which again proved to be a major attraction of people in the event. This artwork is famous and prevalent in Odhisha. Another attraction of the event which gathered attention was the description of all the visits of Mahatama Gandhi paid to Madhya Pradesh in his whole life. Different pictures with the information of his visits to the different areas of MP and also the reason for this visit were mentioned in the photo exhibition. This was conceptualized by Renu Tiwari, Secretary, Department of Culture and her team. Last but not the least that attracted the major part of the crowd was the cuisines from different parts of our country like - Punjabi, Gujarati, Mumbai, Jharkhandi, Kashmiri, Hyderabadi, Bihari, Haryanavi, Rajasthani, Awadhi, Moraina &Agra, Nemadi, Sindhi, Marathi, Malwa, Bheeli. Haryanvi Jalebi was one of the major centers of attraction among all the dishes because of its invariably bigger size which tends people to have it. What is Lokrang 2019 offering? Dharohar - Traditional dance programs. Lokraag - Folk songs of Madhya Pradesh and other states. Deshantar - Dance performances worldwide. 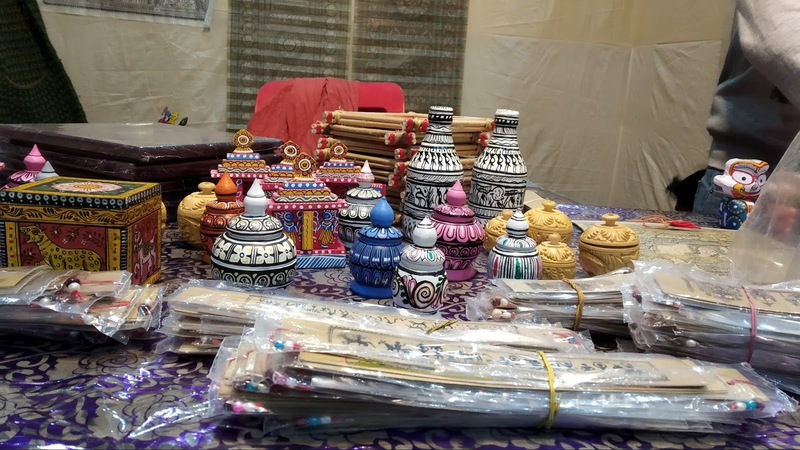 Aakar - Different forms of handicraft items. Ullaas - Puppetry shows, films, stories, and poems for children. Lokvaarta - Books related to culture, creativity, and literature.